Jest Murder Mystery Co. | Washington D.C.
From corporate parties and fundraiser events to public dinners and birthday celebrations we have helped thousands of audience members in Washington bring tears to the eyes of their laughing friends, family and co-workers. 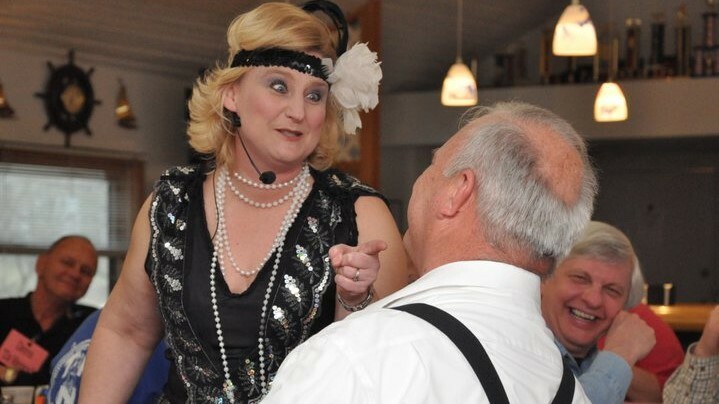 With our entertaining characters, interactive shows, energetic performances and the best murder mystery actors from Washington and across the nation, we treat your guests to a night of hilarity with our murder mystery party entertainment. We truly have the best Murder Mystery Party in Washington, DC! Our murder mystery parties in Washington are interactive comedies usually built around a meal, but they don’t have to be. Plus, all of your audience members will play parts. They can choose a big part, a little part… or just watch. It is up to them! Need a little help planning your murder mystery in Washington? Here are the basics. You will need to arrange for a banquet space, the location and menu of your choosing, perhaps in Washington. Then ask us, Jest Murder Mystery Company, to come in as your turnkey entertainment. Planning a corporate event or company party in Washington, DC and need entertainment? Our message is simple. We provide a great and funny murder mystery parties in Washington for your company event, ones you’ll be proud of, with lots and lots of participation that your audience members will talk about for years! So next time you are booking entertainment for your fundraiser be sure to get your free quote for a murder mystery party in Washington. Hire Jest Murder Mystery Company to provide a murder mystery for your guests in Washington. So many times we here the comment “My friends are still calling me by my character name!”. Don’t you want your name changed too? Looking for something new to bring people to your restaurant or banquet space in the Washington, DC area? Make additional revenue with our tried and true comedic murder mystery shows. Ask about our options for restaurants and banquet facilities in Washington. Our murder mystery shows are just the thing to bring new customers thru your door Washington.